Donna Becco Schroeder Named Principal at Stantec Stantec has named D o n n a B e c c o Schroeder Principal for facility and occupancy strategies for its commercial practice. In her new role, Schroeder will advise clients in meeting rapidly changing objectives through real estate portfolio management and workplace design strategies. She will be based in Chicago. David Burton Joins Avison Young Corporate real estate (CRE) veteran David Burton has joined Avison Young as a director in the firm's New York City office, where he'll work with clients in the financial services, insurance, and media and technology sectors. Previously, Burton was an associate vice president with DTZ and a senior associate at CBRE. DONNA BECCO DTZ Names Michael Casolo President Client Solutions, Global Occupier Services Michael Casolo has joined DTZ as President, Client Solutions, for the firm's Global Occupier Ser vices division. Casolo will head DTZ's global multi- market, multi-region and multi-service line pursuits. Additionally, he will sit on the Global Occupier Services Executive Committee, where he'll work to further develop, refine and optimize DTZ's offerings across its global platform. Previously, Casolo worked for JLL, where he co-lead the firm's middle- market Corporate Solutions practice and served as Chair of its Global Solutions Development board. 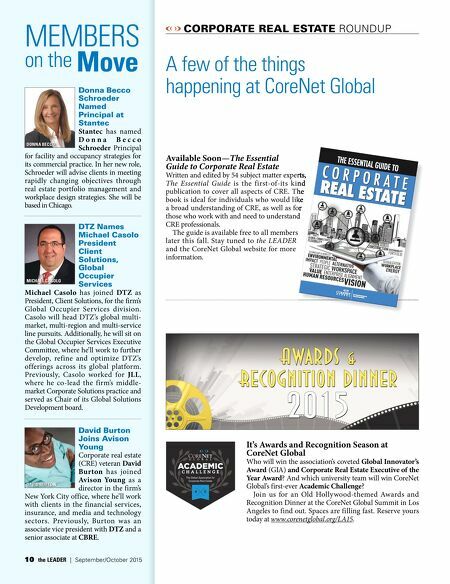 MICHAEL CASOLO DAVID BURTON A few of the things happening at CoreNet Global MEMBERS on the Move 10 the LEADER | September/October 2015 CORPORATE REAL ESTATE ROUNDUP Available Soon—The Essential Guide to Corporate Real Estate Written and edited by 54 subject matter experts, The Essential Guide is the first-of-its kind publication to cover all aspects of CRE. The book is ideal for individuals who would like a broad understanding of CRE, as well as for those who work with and need to understand CRE professionals. 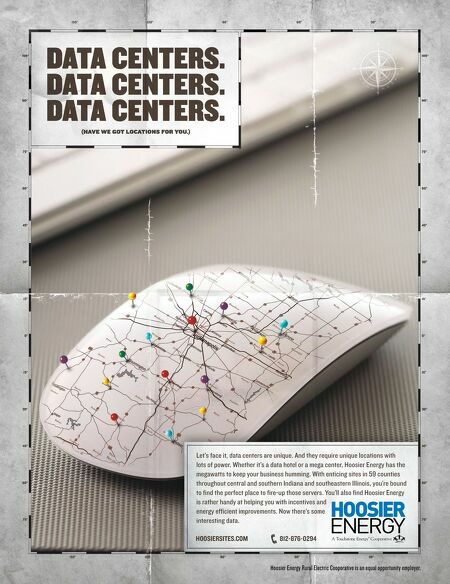 The guide is available free to all members later this fall. Stay tuned to the LEADER and the CoreNet Global website for more information. It's Awards and Recognition Season at CoreNet Global Who will win the association's coveted Global Innovator's Award (GIA) and Corporate Real Estate Executive of the Year Award? And which university team will win CoreNet Global's first-ever Academic Challenge? Join us for an Old Holly wood-themed Awards and Recognition Dinner at the CoreNet Global Summit in Los Angeles to find out. Spaces are filling fast. Reserve yours today at www.corenetglobal.org/LA15.